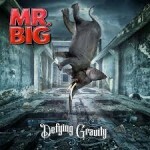 Share the post "Album review: MR BIG – Defying Gravity"
Mr Big occupy something of a unique space in rock with concise, melodic songs yet delivered by some of the rock world’s most revered musos in Billy Sheehan, Paul Gilbert and Pat Torpey, who in spite of the sad onset of Parkinson’s disease is still listed as a band member alongside fellow drummer Matt Starr. The third album since this original line up reformed is their first in three years and does not represent too much of a stylistic departure. Lead off track ‘Open Your Eyes’ and ‘Everybody Needs A Little Trouble’ both have a relaxed and enjoyably bluesy feel, enhanced by a dry, ‘live in the studio’ production and the fact Eric Martin’s voice is sounding a little throatier and more lived in these days. The band seem relaxed and enjoying themselves, though the otherwise impressive title track is let down by a rather annoying drum sound. ‘Damn I’m In Love Again’ is an acoustic driven yet up tempo song that reminds me of ‘Love The One You’re With’ and along with the mellow ‘Nothing Bad (Bout Feeling Good)’ has a seventies feel. ‘Mean To Me’ sees some looser jamming, while ‘Forever And Back’ and ‘She’s All Coming Back To Me Now’ bear all of Eric’s melodic hallmarks, the latter even harking back to a Beatles influence albeit with a typical solo from Paul full of his usual arpeggios and flourishes.. The mixture of blues rockers and mellower moments is disrupted late on: ‘1992’ is the most unusual song on the album, with a slightly disjointed hook married to self-referring, almost boastful lyrics about the year ‘To Be With You’ was an unexpected global chart topper. ‘Nothing At All’ has an almost psychedelic guitar sound while the seven minute closer ‘Be Kind’ goes through several movements which are almost a potted history of music: it begins as a bluesy swing with doo-wop style harmonies, gradually rocks out with a slide guitar solo then when the song appears to be over, there is a coda of a frenetic two minute power trio jam that is at odds with the laid back nature of the rest of the album, almost as if to prove no-one could outdo these musicians if they chose to fully rock out. This entry was posted in ALBUM REVIEWS, ALBUM REVIEWS (Mobile), All Posts and tagged album, Billy Sheehan, Defying Gravity, Eric Martin, Matt Starr, melodic rock, Mr Big, Pat Torpey, Paul Gilbert, review. Bookmark the permalink.